No game system is complete without a Bomberman game, and happily the Gamecube now has a good Bomberman game. Let the multiplayer madness live on forever! I have no idea when I first played Bomberman back on the system that saved the console industry - the NES. However, to this day, I will gladly pull out the 8-bit monster of a spring-loaded system for the simple pleasure of taking on the classic game once again. When Super Bomberman arrived on the SNES, the angels in the heavens rejoiced, for it enabled four friends to test their relationships by repeatedly attempting to incinerate one another over the span of many hours. Many people to this day consider Super Bomberman 2 to be the best party game ever made. Personally, the reclusive Saturn Bomberman will forever have a warm place in my heart. Indeed, over the years, there have been countless incarnations of the funny little blue and white guy with the huge head, power-outlet eyes, and proclivity for hurling explosives at oddly shaped enemies. From the NES all the way through the SNES, PC, N64, Playstation, Saturn, Dreamcast, and more, Bomberman is an integral part of gaming culture - as important as Mega Man, Metroid, Sonic, and Donkey Kong. I am happy to report that the Gamecube scion of the legendary game series lives admirably up to its predecessors' high standards. For those of you who have not experienced the joy of this series in any of its forms, some information is in order. The premise of this (and any) Bomberman game is rather simple, and the story nearly always is merely an afterthought attached to brilliant gameplay. Essentially, you are Bomberman, a diminutive yet mysterious figure with an infinite supply of bombs. In the one player mode, you are on a quest to regain the powerful Bomb Elements, mystical talismans that can grant extraordinary powers, stolen by the evil group of baddies with the silly name, the Hige-Hige Bandits. In the quest mode, you can move freely in 3D as you navigate and explore the lush worlds Hudson has designed, blasting obstacles and enemies out of the way with your bombs. The blast radius and number of bombs you may simultaneously set can be upgraded with items found in the field, and each level contains a number of hidden power-ups. The ability to charge up bombs to create an extra-powerful blast (see Bomberman 64 on the N64) has been inherited from previous versions. 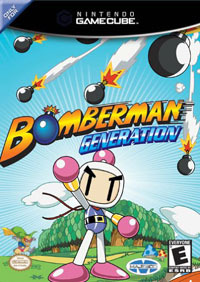 This particular mode also includes odd little creatures called Charaboms, Pokemon-type beings that endow Bomberman with particular special abilities (such as being able to remotely detonate your bombs, jump on your bombs to reach far off-ledges, and protect you from enemy damage to name a few). In order to gain new Charaboms (there are 18), you must challenge the prospective creature and best it in a cute little duel. The Charaboms can be leveled up as you progress through each stage with special items, and they add a nice bit of diversity to the game. There are also five different types of bomb blasts to be discovered in the adventure mode (fire, ice, wind, water, and light) that help you progress in the world. You will also encounter four mini-games during your quest, offering a welcome break from wandering around and blowing things up. Now, that is merely half of the game, and some may argue it's the LESS important half of the title. Bomberman truly shines when you kidnap your friends and slap the freakish looking but undeniably comfortable Gamecube controller in their hands and power up the battle mode of the title. Here, the game mechanics are largely unchanged from the original the NES Bomberman. The camera stays obediently in one position as the game goes on, despite the new-fangled 3D cel-shaded graphics. And the goal is as simple as ever - survive! There are five different flavors of the multiplayer game, including the traditional "Standard Battle." Here, up to four players fight each other on a grid and try to be the last man or woman standing. "Dodge Battle" is a flavor of survival that doesn't allow any of the players to be armed. Rather, bombs fall relentlessly from the sky and you simply must outlast your opponents. Then there's "Revenge Battle," a game where the goal is to blast as many moles as possible from the perimeter of the stage and rack up 5000 points before your fellow players can. Finally, there is also a "Coin Battle," where the goal is to gather as much money as possible to win, and "Reversi Battle," where each player's bomb blast causes the floor to flip over in the player's color, and the player with the most reversed floor tiles wins. Each of the four players can be set to be human or computer-controlled (with multiple difficulty levels), and most of the rules can be altered within the battle-mode option settings. Even the type and frequency of power-up items can be manually set prior to gameplay. If you've played Bomberman before, you'll love this. If you haven't...well, let's just hope you aren't taking any summer courses, or don't have anyplace you need to be anytime soon. You are going to spend a lot of time running around mazes with your friends blasting each other into oblivion. Jumping on the bandwagon designed, mastered, and touted by Sega, BG employs cel-shading to present Bomberman's world as a surreal cartoon with incendiary devices. The game is in full 3D, but the cel-shading technique applies a black outline around the player's view of the 3D models in the game, giving the impression of a cartoon brought to life. While nothing could touch the style and hipness found in Sega's stylish games, cel-shading innocently emphasizes the cartoonish nature of Bomberman. This is an admissible use of the visual trick. Animation is fluid and appropriately exaggerated, and this is easily one of the most colorful games I've played in a long time. From the enemies to the textures, it is somewhat reminiscent of Super Mario World 2, frequently appearing to be a colorful watercolor painting more than a video game. It contains nowhere near the level of detail found in Halo or even Super Smash Brothers: Melee, but the graphics work perfectly to get players into the game. The framerate is rock-solid at 60 frames per second, heightening the sense of speed and action.